T-Rex Engineering is pleased to announce a new version of our renowned Dr Swamp distortion pedal – now raised to the second power. 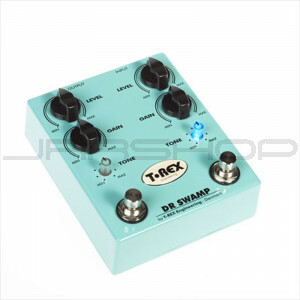 With two Dr Swamps in a single pedal, you can toggle between your favourite Dr Swamp settings to deliver two brands of sweet T-Rex distortion without tweaking any knobs. Try it, and you’ll find it’s the pedal you’ve been waiting for – incredible twin distor-tion in a single stomp box.